This is intended as a Server Only mod. It does not need to, and should not, be installed on client side. Lag'B'Gon is a lag reduction utility. It will automatically scan for entities and dropped items at configurable intervals, and remove them from the world, unless they're blacklisted. 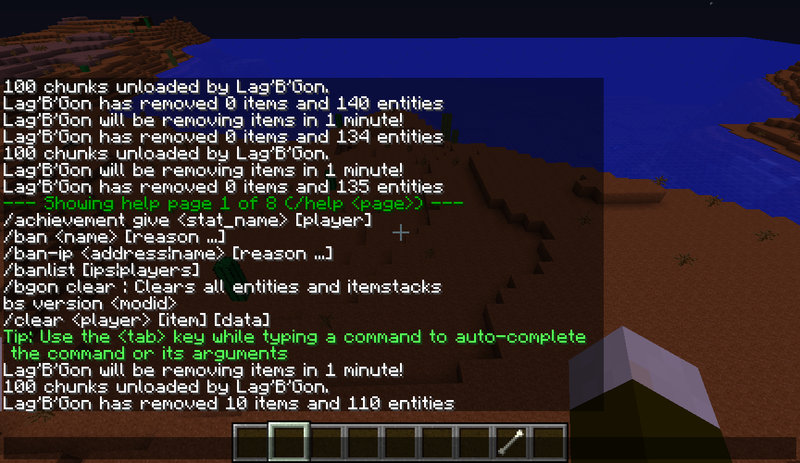 Additionally, Lag'B'Gon can unload chunks when TPS drops below a configurable level. (Although you cannot set it higher than 15 TPS). Lag'B'Gon is also capable of preventing overbreeding. Players can work around the protection, of course, but it will still help. All configuration can be handled in game through the /bgon command, and it's sub commands. /bgon is only available to ops. If I receive requests to, I will see about hooking into Forge Essentials permission system, but it is not a priority. /bgon toggleitem : Places the item you have selected on your hotbar into the item Blacklist, preventing it from being removed during Clears. /bgon toggleentity <name> : Places the named entity into the Entity blacklist, preventing it from being removed during Clears. This would be the displayed name of the entity, so "Skeleton" would cover skeletons, but not "Wither Skeleton". Use the names displayed by /bgon scanentities for best results. /bgon clear : Manually runs a Clear, removing items and entities from the world. /bgon interval <time> : Sets the time between automatic Clears. The interval is actually 1 minute longer, as it includes a 1 minute warning. /bgon toggleauto : Turns automatic clearing on and off. /bgon listitems : Lists the contents of the item blacklist. /bgon settps <tps> : Sets the TPS below which chunks will be unloaded automatically. Cannot be set higher than 15 in game. If you're insane enough to want it higher, you can do so in the config by hand. /bgon unload : Manually unloads unused chunks. /bgon scanentities this will give you the name of all nearby entities (10x10x10 cube), exactly as it should be entered into the blacklist, to prevent /bgon clear removing them. /bgon togglepolice : Turns automatic policing of breeding on. /bgon setbreedlimit : Sets the maximum allowed mobs of type EntityAgeable in a 10x10x10 chunk, before more breeding is prevented automatically. This mod is still an early release, please test thoroughly before using on anything like an important server. Any chance for a 1.12.2 port? Having this is no use. # List of Entities not to destroy. &gt;<br /><br />Should I not have used a comma between entity names? Please consider adding in a whitelist option. I have been looking for a temporary fix to issues I have having with JAS spawning WATERCEATURE entities outside of the water. If Lag'B'Gon could be configured to only sweep for fish, ink sacks, and eggs my issue would be solved. Blacklisting all entities but 3 is a little too cumbersome. This mod would be perfect if it could filter out an entity ID list even so players can filter out mobs and items instead of missing some things and having to keep adding items. Or have an option in the config file where it could blacklist all mobs or blacklist all items even. One issue I am running into is the Hydra from Twilight Forests Body keeps disappearing even though it's called "unknown" it doesn't work and just breaks the mob. This mod has caused MASSIVE lag on our server. It's doing what it says it will do, but it's actually making things worse, not better. This mod is great, but you MUST put an warning that it remove any kind of entities . My server was overload and this mod saves me, but in the other hand it remove all entities include villagers, iron golem, Thaumcraft's golem's, Botania sparks and etc. I had even a player that died because the mod removed his hand glider while he is using it. It's something used on the server side, to reduce TPS lag. Oh. I thought it was for reducing lag on the world your playing and the server. It is intended to reduce lag on servers due to too many entities, or dropped items. It also prevents over spawning of mobs in poorly controlled farms, if configured to. It does nothing to help single player worlds, nor does it help with fps lag, only tps. So this mod is supposed to reduce lag for Better Gameplay?